Has anyone else been struggling for design inspiration or ideas lately, or is it just me? Perhaps I can blame this sad New England weather or just chock it up as a silly phase, but lately (as evidenced by my lack of blogging) I've been having a hard time finding just about anything to get my design mojo moving. And that's why I was particularly excited to see Elle Decor's In Living Color Spread this month. There is nothing that can kick you out of a funk than gorgeous, vibrant interiors and this is precisely what these images did. Perhaps what I like most about these rooms is that they are not overly trendy. 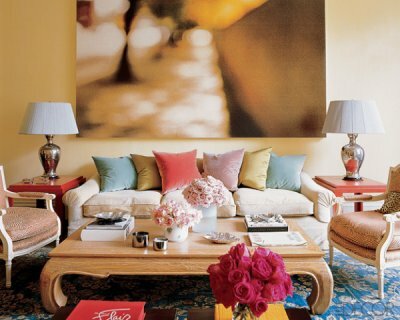 It's not too often that we can combine classic lines and furniture with bright, unexpected color schemes. I hope you enjoy as much as I did! You may have seen this room by Rafael de Cárdenas before as it was featured in ED in October 2008 but how can you not love the violet jewel tones throughout this living room. It's the perfect marriage of vintage and modern! 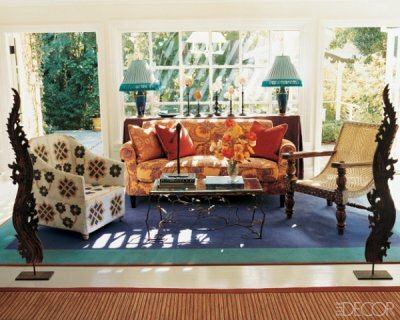 At first glance, this may seem like your typical neutral-toned interior but than the rug grabs your eye and you see the merging of so many fantastic colors throughout this space. 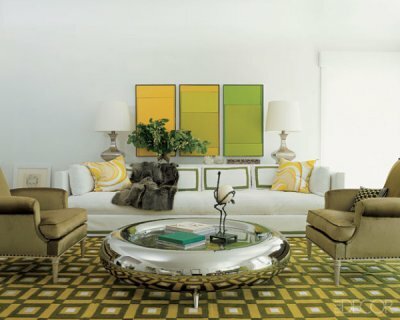 There is something so serene and calming about the use of yellows and greens in the this room. Again, fairly neutral in certain elements which only lets the color steal the show that much more. As much as it seems zebra prints, chevron and lucite are being overused in interiors recently, I don't think I'll ever get sick of ikat patterns. 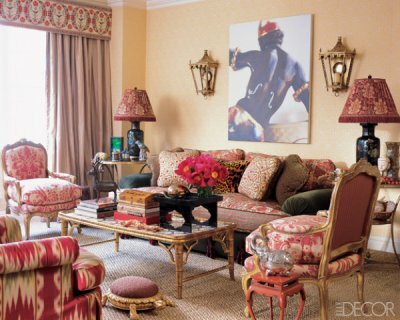 It could be because it's such a timeless look and the fabrics in this room are no exception. This picture is the exact reason why I love the artistic genius and fearless approach to unique color schemes that are seen by the very best designers. The red and pink tones with light blue walls couldn't have a more perfect balance and considering the small size of this room, it's all that more impressive what Suzanne Coleman accomplished in this space. I love how Miles Redd post-war era design to his interiors. It's so timeless yet completely fresh. Even though this room is from a Manhatten home, it makes me want to go to the Hamptons. So crisp and airy, you'd never guess the hustle and bustle of the city is right outside that window. It's no secret the power of pillows in a space but I can't think of a design that defines that philosophy more than this room. The pillows dictate the entire color scheme so your eye than travels to the rug, side tables and perfectly accessorized flowers and coffee table books. While I certainly respect the uniqueness of this room, I don't know if I'm the biggest fan of this lavendar color especially after seeing how Rafael de Cárdenas used it in the first photo. Regardless, the colors from these rooms couldn't be more inspiring and make the grey skys outside my window seem completely irrelevant. I hope you've enjoyed these photos from Elle Decor as much as I have!